Choose your favorite Ferrari or drive all three models in our fleet! Ferrari F430 F1, Ferrari 430 Scuderia and the Ferrari 458 Italia. 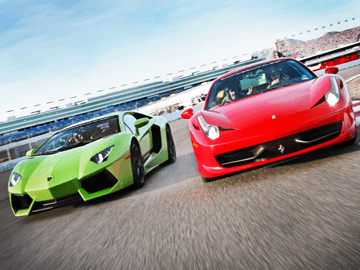 Get behind the wheel of the powerful Lamborghini Gallardo LP550-2 and the 700 hp Lamborghini Aventador. GIVE THE GIFT OF RACING! Join our supercars in their natural habitat on a racetrack. For the ultimate gift you can't go wrong. Let them choose an experience with up to 4 different supercars for $999. Take up to 20 laps in 4 different exotic cars (5 laps in each car), choose the Ferrari F430 F1 + the Lamborghini Gallardo and then two of the following… Audi R8 V10, Aston Martin Vantage S, Corvette Stingray Z51, Nissan GT-R or the Mercedes SLS AMG.